Regal Rusty needs our help! This sophisticated 12 year old German Shepherd mix (you can’t see his ears in this photo, but they’re there!) recently parted with his 91 year old owner when she could no longer care for him. If you’re not going to have a pet be indoors with you the majority of the time, give it lots of love, prepared to pay vet bills in an emergency and make a life time commitment then a pet is not for you. This is something we are passionate about and really want to get the message across to adopt not shop and that it’s a lifetime commitment of love! We believe Rusty’s owner loved him dearly, and she would be utterly heartbroken to know that her baby is lingering at the city shelter. And Rusty, of course, has no understanding of what happened and why he is not with his former owner anymore. Rusty also appears to be growing depressed at the shelter. When visitors walk by he stays in the back of his kennel and won’t come up to the front to meet them. We encourage any potential adopters to request a meeting with Rusty at the shelter, don’t let his seemingly disinterested behavior turn you away! 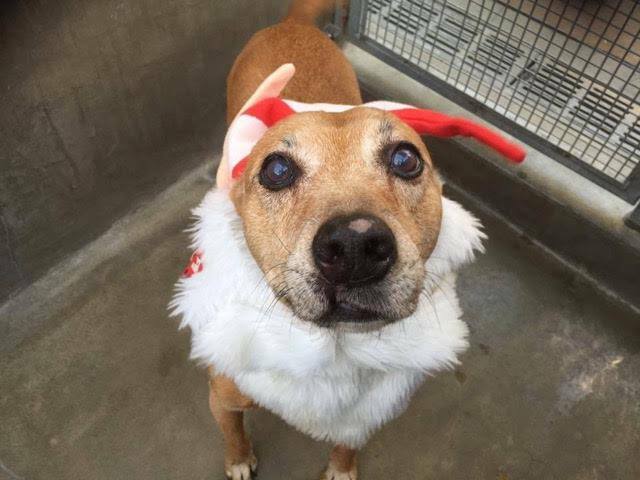 A volunteer wrote, “Regal Rusty is a lovely 12 year old Shepherd mix who has found himself at the shelter as his beloved person can no longer care for him. Rusty was owner-surrendered (by owner’s son) because she (91-years-old) could no longer care for him, nor could the son. This is a heartbreaking situation for all, and we are hoping Rusty can find a new home soon. Rusty walks well on leash and still has pep in his step, and as soon as he feels comfortable he’ll lean on you and bury his head beneath your arm, it’s so sweet! The son said Rusty was good with other dogs but, at the shelter, he appears ‘dog-selective,’ especially around more active dogs, especially because he might have limited vision. I have found, however, that he is food-motivated, so if he barks at another dog or goes to approach one I offer him a treat and he calms down. As for cats we have no way to evaluate our dogs with them. However, Rusty has not shown any interest in the ones behind glass windows in the shelter lobby. Also, he is not too fast so I think cats will be safe with him. I haven’t seen him around kids, but if they are old enough to know not to sneak up on him or startle him (just because of his cataracts), I don’t think it would be a problem. He greets everyone when I have him in the lobby and there hasn’t been anyone he hasn’t wanted to snuggle with. Rusty is adorable. I have 4 dogs myself that we adopted over the years and just adopted a pup a few months ago. They all bring such joy to our family. I couldnt imagine my life without them all. Breaks my heart that this sweet dog is depressed… So important for people to adopt animals rather than go out and spend ridiculous amounts of money on a designer animal… So many animals, who are loving, need homes.